Go to Barron's, online at Buy.Barrons.com, to save on subscriptions to the current and in-depth weekly financial magazine. Barron's offers insights into weekly developments in the world of finance and features the Economics Beat column by Gene Epstein, columns by Alan Abelson, and the latest technology, market, and mutual fund news. Barron's online offers discounts and bonus features with each subscription, and provides both print and online subscriptions. But before you get the latest scoop, be sure to save with Buy.Barrons.com discounts, Barron's promotions, and Barron's coupon codes, found here at RetailSteal.com. Take 60% off newsstand price of Barron's Magazine when you subscribe. Click link to start. Take $70 off an online subscription to Barron's Magazine. Click here to get it today and save. Enjoy 60% savings with a Barron's Magazine print and online combo subscription. Get one whole year for only $149. Click link to start. Get one year's access to Barron's online for only $79. Click here for this limited time offer. 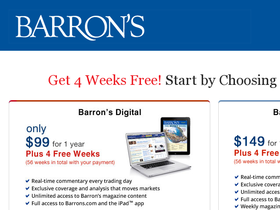 Get 4 weeks of free Barron's Magazine online. Plus enjoy a free trial. Click link to find out more. Enjoy a one year subscription to Barron's Magazine for only $99. That's 60% off cover price. Click link to start.